Cold Platter Competitions: Nothing Easy. A guest post from Chef Kevin Doherty. There are many chefs who have turned their back on cold food competitions as they believe they take too much time and require a dying skill in the profession. I believe the exact opposite and encourage any and all chefs to take part in these competitions. In my opinion, if you can do cold food well, you’ll do hot food even better. 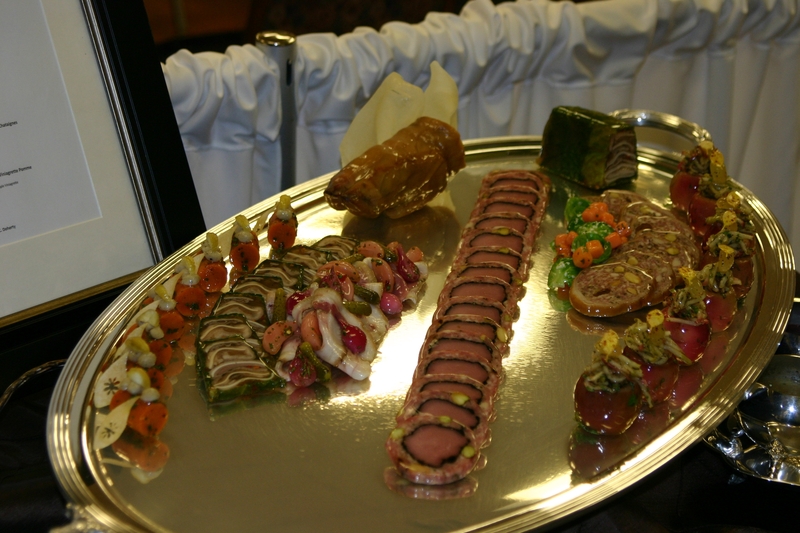 I recently took part in a cold platter competition in Ohio that required my full attention and energy. The event was located in Ohio which posed a large challenge for me as I oversee operations of TD Garden in Boston. To accomplish everything I needed to, I worked on some of the big pieces for the platter in Boston after my 10-12 hour work days at TD Garden. It required me to put in a lot of time on the weekends and evenings to manage my responsibilities at the Garden and put myself in the best position to perform well at the competition. In all honesty, it took me several weeks of preparation. When the time came to put everything together for the event in Boston, I loaded all the items I’d prepared into a cooler and drove the 10 hours from Boston. When I arrived at the competition site, I had to become quickly acclimated to a different kitchen and working without any assistance from other chefs. The platter itself consisted of three pieces of the pig that are traditionally unused – the ear, foot and tongue. The true skill of a good chef is to turn nothing into something and make it a thing of beauty. That was my intention with this platter. Along with preparing the food items, I also needed to pour gelatin on the platter that would hold each item in place. This is an incredibly difficult step as you lose points for any ripples or bubbles that are created during your pour. You need to be extremely careful to get it right because once you set something on gelatin; you won’t be able to move it anymore. In the end I received a high silver medal with a score of 33.9. I missed a gold medal by just a pinch. I received a perfect score for my gelatin pour but lost points because my platter had some empty spaces and my apples were considered too large. I have included photos of the platter in this blog post. I am proud of my effort as these are not easy competitions. I know that I could have achieved gold had I made one or two slight adjustments, and that will motivate me for future cold food competitions. Once I’d wrapped everything up in Ohio, it wasn’t time to relax. One of our chefs in Buffalo had a minor health problem and needed my assistance preparing for a weekend sporting event. As chefs who work for the same company, we always have to be ready to pitch in and help each other out. I was happy to quickly travel to Buffalo and oversee the long days our culinary team needed to prepare. Needless to say, it was a rewarding and challenging experience, but one that didn’t provide me much time to sleep. This entry was posted on Monday, October 25th, 2010 at 11:18 am and is filed under Uncategorized. You can follow any responses to this entry through the RSS 2.0 feed. You can leave a response, or trackback from your own site.